In the generation of digital 4.0, e-commerce is a topic that received much attention from many countries, because of its great contribution to economic growth. This is an inevitable development, in line with the trend when the traditional economy is gradually saturated. Nowadays, there are many e-commerces platform on Internet. If you are looking for the most essential method to build your e-commerce store, using WordPress is the most selected one. There are million of pre-made WordPress e-commerce theme for the website users to choose. WordPress is a convenient website platform to manage content at no cost. You can totally maintain control your content. But before starting with a theme, you need to have your website ready with a hosting plan and a domain name. The next step is applying the WordPress theme that help you to design and illustrate your site as an attractive e-commerce store. Moreover, to run an e-commerce website, it requires you to activate WooCommerce plugin (free). But it’s not that hard to do on your own. However, there are amazingly an option that will save you much time and effort on creating an online store – using pre-made e-commerce WordPress themes. These templates provide beautiful designs with tons of functionalities that you need to sell products. So, it only takes you few hours to have a complete website and post the first products to start selling. The exciting world of e-commerce WordPress themes are getting bigger and bigger through years. Therefore, you need to keep up-to-date with certain themes that has beed made everyday. 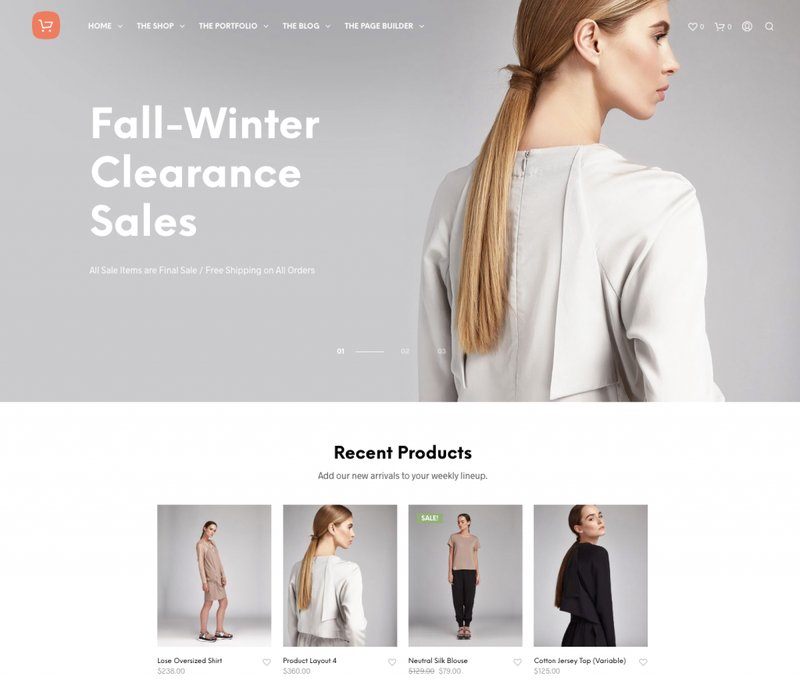 In this article, I will give you a list of the best WordPress e-commerce themes for 2019. Enjoy and choose the one that you like the most. Galax is one of the best WordPress e-commerce Themes on ThemeForest supermarket. The theme comes with 13+ pre-made demos which can fit any purpose of an online store. Among them, demo E-commerce Store has been well-designed with beautiful and attractive layouts which perfectly fits for a modern website. With integration with WooCommerce, you can manage, create products in many categories and show them in the homepage. The slider on homepage based on Slider Revolution helps you to highlight best-sellers or the hottest deals of your businesses. It is a significant piece of your website to capture the users’ attention. Moreover, your customers can also search for the products they are looking for with the search bar at the top of homepage or in the side bare at any product pages. Shopping cart and Wishlist always locate at the top right of your page using this WordPress e-commerce Theme. A section shows a count down box will be a great idea to show your new coming soon products or deals. Besides, the theme has 100% Responsive and Retina Ready that helps your website show beautifully and perfectly with any device. Only by one click installation, all demo content will be ready on your website. You just need to implement some simple work to adjust images and content with WP Bakery Page Builder to show your brand awareness. In addition, Galax has many other features which makes it as an amazing theme for your website: SEO Optimization, Faster Speed, Translation Ready for Multilingual, 600+ Google Fonts and 24/7 Exclusive Support from developer team. So, with great functions and features, Galax will be extremely WordPress e-commerce Theme for your online store. Flatsome is one of the top selling WordPress e-commerce Theme in ThemeForest marketplace. With high rating and over 80+ thousands of sales, this theme reaches more trusts of customers. 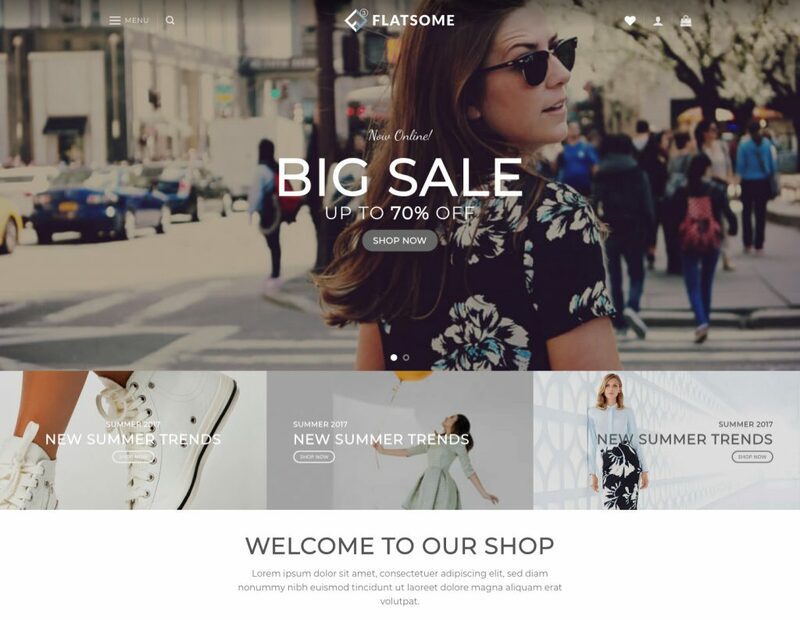 In a nutshell, Flatsome is the perfect theme for your shop/e-commerce/online store. It has all tools need to create super fast responsive websites with amazing user experience. Unlimited options with a revolutionary responsive page builder, gives you the ability to create anything without any coding. Amazingly, the newest update of Flatsome has WordPress 5.0 Support. The UX Builder (inside the theme) is 100% compatible with new WordPress Block Editor. You can use UX Builder for advanced layouts and new WordPress editor for beautiful content. A large library of Live Page Builder will give you options to choose any element for your website. Moreover, this e-commerce WordPress theme has optimization for SEO and Speed which help your website get higher ranking on Google Search Result. The most important things is that the theme has integration with WooCommerce – all you need to sell anything online. Kallyas introduces the World’s most enjoyable WordPress Theme. With over 65 demos including many demos for an e-commerce store, Kallyas has been trusted by many WordPress users. 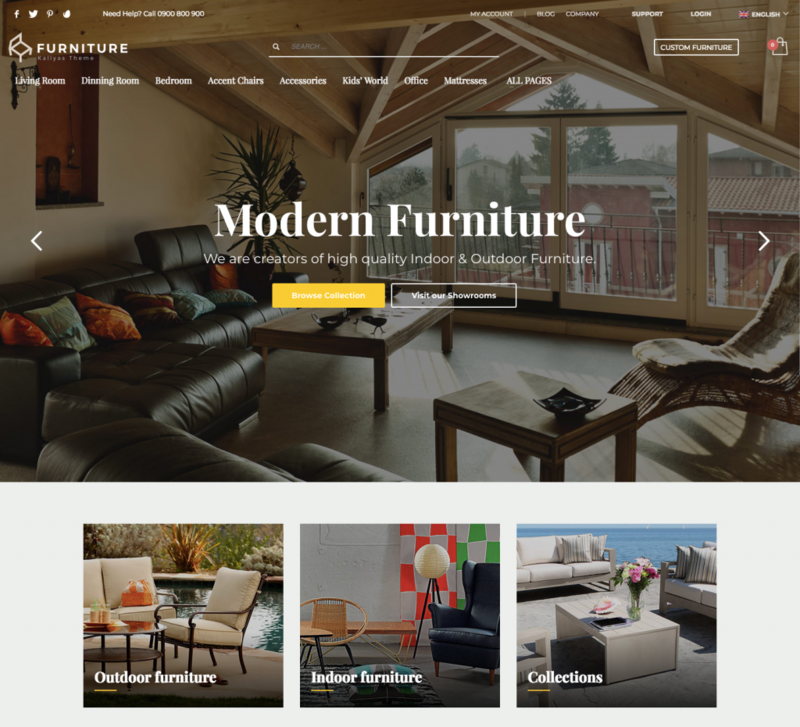 This theme will help you to set up a full e-commerce website in minutes. Coming with easy to use drag and drop page builder – Visual Builder you can build almost any page imaginably. The theme includes 100+ pre-built elements to suit any application. There won’t be wasting time around to self-build your page without any support. The Revolution Slider also makes your website more attractive with beautiful hero images and sliders. If you have any problem with Kallyas, the professional support team will help you to solve it faster. Unlike other WordPress frameworks and page builders, this e-commerce WordPress Theme is doing its best to load faster with SEO Optimization for higher Google ranking. Believe me, you will pretty much love Kallyas. When you start with an awesome product you can create amazing things! Built with the eCommerce functionality in mind, Shopkeeper is a fully responsive Premium WooCommerce Theme with a great design and extensive functionality. Shopkeeper – WordPress e-commerce Theme is here to put your products in the best light. 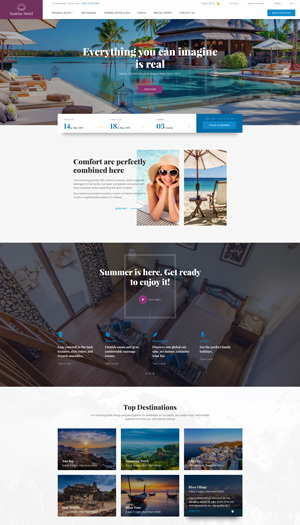 With amazing layers, website using this theme can reach much attention from the customers. The new version of Shopkeeper offers you YouTube video in Product Galleries allowing you to show of video preview for your products in order to bring better user experience. Besides, Shopkeepers will make your website be a hassle-free beautiful online store to tell your story and sell your products online. With quick setup, easy maintenance and great customizer options, this WordPress e-commerce theme will save tone of time for setting. No coding requirement. Moreover, drag-and-drop page builder will help you to easily to create new layouts that fit your needs. 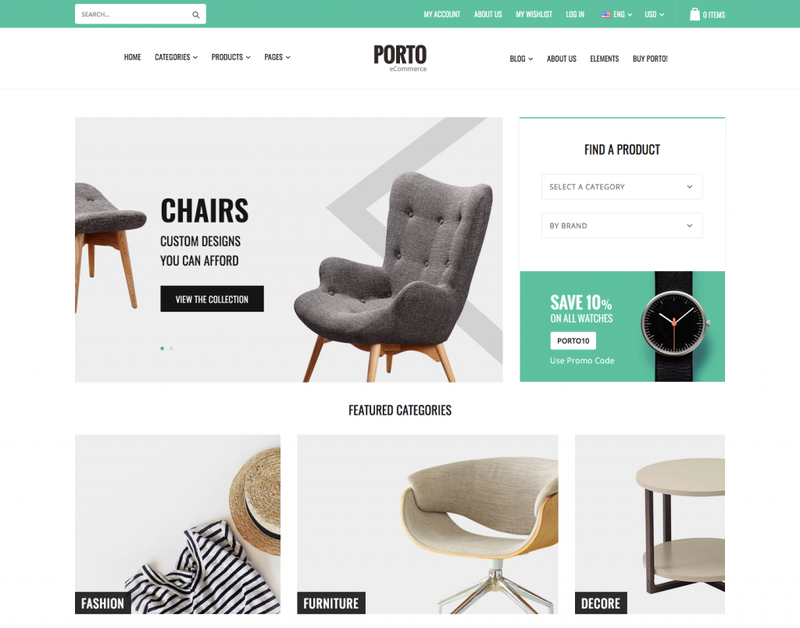 Porto is a super fast WordPress e-commerce Theme with ultimate WooCommerce features. It is suitable for any kind of business and extremely optimized for site performance. Porto Optimizaer tool helps you to build an “A” class speedy site. With this tool, even major plugins like Visual Composer and Revolution Slider become 2 times faster than original. Besides, this e-commerce WordPress Theme comes with 20 demo variations and creative layouts and powerful e-commerce features for a professional store. Moreover, don’t worry about your low level servers, Porto still works fine even with shared hostings while other themes requires some server requirements. You can display your website beautifully using this theme in any device. All elements will display very sharp in ultra-high retina options. 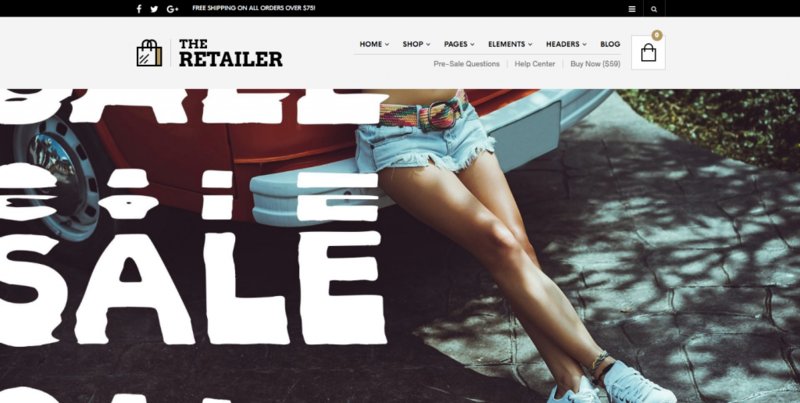 The Retailer is one of the bestWordPress e-commerce Theme solution for an online store website. 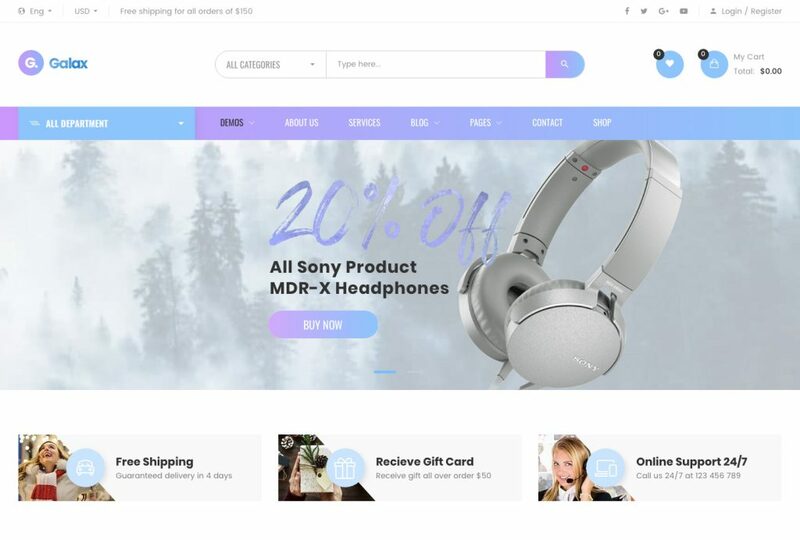 You can sell anything online with this theme. You can choose shippable or downloadable products for your online shopping. A wide range of product variation allows you to sell products in different variations such as color, size or anything else. You can also sell e-books, CDs, music, design templates or any other digital products which can be downloadable. Moreover, your customers will be free to add more value to your store items by giving reviews to the products for better social validation. You can also earn money online by selling products from external sites and affiliate partners such as amazon.com. Additionally, The Retailer accept different methods of payments such as PayPal, Credit cards, Checks, Cash on Delivery. These are the built-in payment methods but you’re not limited to choose only one listed above. Shoom is a WordPress e-commerce Theme has been developed with HTML5 & CSS3 valid code. The theme has clean and minimal design in 16+ demos for e-commerce store. Grids of products has been beautifully shown in the homepage which help customers to easily look for their needs. You can import all demo content with just one click. Besides, the Shoom’s developers built the theme on a convenient and popular grid design – Bootstrap 3.0. Moreover, using Shoom, you will be no longer to worry about the site speed as all pages are optimized for fast and high-quality work. This theme will look equally good on all devices and smartphones with all images which has retina displays. Additionally, This WordPress e-commerce Theme is also compatible with translator plugin which makes it easier to translate to any language. A user friendly documentation coming with the theme will enable you to modify and customize the theme. Why should you not try Shoom today for your e-commerce website? 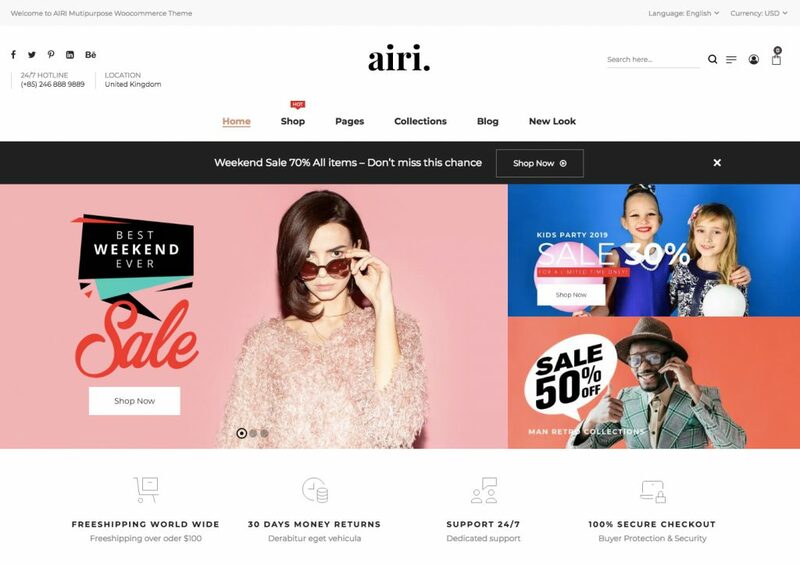 Airi WordPress ecommerce theme provides 20+ pre-made homepage layouts focussing on products (11 fashion demos and 9 furniture demos). The products range is very easy to import and highly customizable. You can mix elements to create your own layout. Besides, this e-commerce WordPress theme makes it simple to setup and manage an online shop. Not stopping there, Airi theme is fully responsive that helps your website show beautifully with pixel perfect in any device. With Airi, your website will not only have faster loading speed but also SEO optimization for better Google Ranking. Moreover, you can get 24/7 support from professional team if you have any problem when using the theme. Amazing collection of themes. Thanks for sharing. You can also give a try to one more excellent theme called Kosmic. It’s a multipurpos WordPress theme developed with all modern featrues to help you beat the Global competition.